Zoom, Zoom, Baby! : A Karen Katz Lift-the-Flap Book Just $4 Down From $7! You are here: Home / Great Deals / Amazon Deals / Zoom, Zoom, Baby! 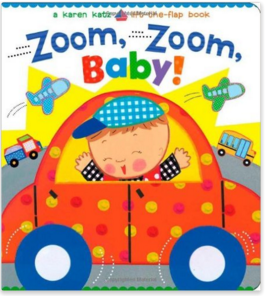 : A Karen Katz Lift-the-Flap Book Just $4 Down From $7! Here’s a fun read along book that would make a great stocking stuffer! Zoom, Zoom, Baby! : A Karen Katz Lift-the-Flap Book is just $4 down from $7 on Amazon! Get yours now while it lasts! Enjoy the ride with this interactive Karen Katz lift-the-flap board book that features different animals on the go! Is Baby on the bus? No! It’s a silly monkey! In this transportation-themed board book from Karen Katz, little ones can lift the flaps on each spread to reveal adorable animals inside a variety of vehicles, such as a train, a plane, a truck, and more! But where is Baby? With Katz’s signature bright, striking art, this board book with its sturdy, easy-to-lift flaps is sure to zoom onto bookshelves everywhere.